On their third post-reunion album, synth veterans OMD's triumphs more than make up for a somewhat dated message. For a band that relies so much on technology to create their music, OMD has always seemed terrified by the modern world. Over the course of four amazing albums in the early 1980s, they mined this fear for some timeless, delectable pop music. The band was prescient, too; an early hit like "Messages" now sounds like an eerie premonition of the isolation and loneliness fostered by the digital age. OMD's discomfort peaked with the brilliant dystopian concept album Dazzle Ships (1983), after which they surrendered to the 20th century and moved toward complacent, stylized synthpop. Since their reformation in 2006, principal members Andy McCluskey and Paul Humphreys have found the 21st century no less concerning than the previous one. If History of Modern (2010) saw them regaining their feet and English Electric (2013) was an attempt make peace with all the modern world hath wrought, The Punishment of Luxury brings back the fear, and a little loathing, too. But what were bold questions and striking observations for pop music 30 years ago now sound almost routine. Technology and conspicuous consumption have become rather soft targets. So, while The Punishment of Luxury is the least orthodox of OMD's post-reunion albums, it is also in a way the most dated. After all, fellow synth maestros Heaven 17 released The Luxury Gap the same year Dazzle Ships came out, and acts from Pet Shop Boys to Radiohead have since used pop music to skewer the same targets Punishment of Luxury has in its sights. This less-than-fresh premise is what makes The Punishment of Luxury a quite good album rather than a great one. Songs like the title track, "Robot Man" ("there's a hole where your heart should have been"), and "Art Eats Art", which features an unflattering mid-'90s dance sound to boot, are mere silliness rather than tongue-in-cheek commentary. Sure they are catchy; that has never been an issue for OMD. But they distract from the fact that much of the rest of the material is on par with the band's best. No one else sounds like OMD when they are at peak power, building sparkling arpeggios and towering synthesized cathedrals that are simultaneously euphoric and resigned. "Isotype" has an effortless Europulse that is more Kraftwerk-inspired than usual. "One More Time" is a good ol' fashioned OMD love song, while "What Have We Done" is one of Humphreys' winningly guileless vocal takes. All are as lush as one might hope them to be. McCluskey, for his part, can still hit the high notes and emote effectively, as he does on the elegiac closer "The View From Here". He is appropriately mournful on the expansive "Ghost Star"," which has its lineage in past mood pieces like "Stanlow" and "Sealand". Like many of the best OMD songs, it has the feel of church music to it. More abstract sound collages "Precision & Decay" and "La Mitrailleuse", the latter constructed almost entirely of arms fire, are as stark and affecting as anything the band has created. 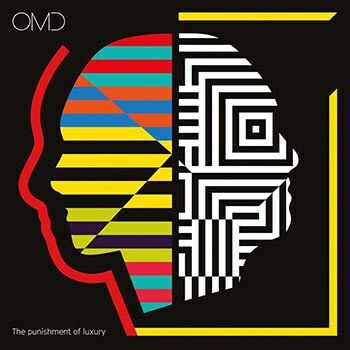 Like all of OMD's post-reunion releases, The Punishment of Luxury sounds too clean, too digital for its own good. There's too little of the analog muskiness that made their early work so haunting. Drummer Malcolm Holmes, forced to retire for health reasons, is sorely missed. Nonetheless, even if OMD's message is an old one, it is one they can still deliver quite well.